UW Recycling collects cartridges and fuser drums for our contracted vendor to recycle or reuse. Any new or unused items should be sent to Surplus. Option 1: Place the used item in a cardboard box. Write recycle on the box. Option 2: Place the used item in a clear plastic bag and tie it off. Option 1: Take the printer/copier cartridges and components to a nearby collection location (listed below). 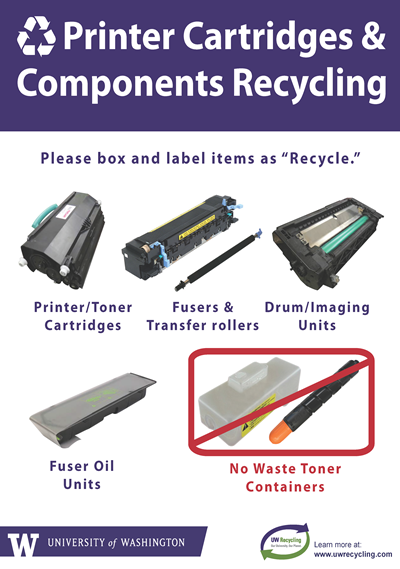 Option 2: If you are in a building without a designated toner collection location, request a boxed recyclables pickup If possible, please accumulate at least one Bankers Box full of small printer cartridges, or six boxes of large toner cartridges, before requesting pickup. The following must be disposed of as waste. Recycle cartridges through the manufacturer’s recycling program or through Office Depot by using their free cartridge collection boxes. The Office Depot free collection boxes come with pre-paid shipping labels and can be ordered online through Procurement Services (#621-558 for inkjet boxes and #650-988 for laser toner boxes). Seal the used cartridge in the box from the new cartridge before placing in the Office Depot boxes. UW Recycling will collect unused cartridges and components as part of a Boxed Recyclables Pickup. Alternatively, you can send them to Surplus.